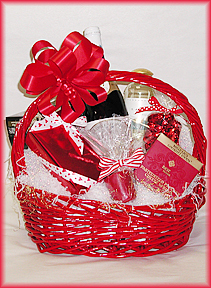 Surprise your lover with our Risque Basket. You may choose from the following items: wine or champagne, chocolates or truffles, chocolate body paint, love tester, candles, massage lotions, pleasure balm, assorted sensual books and more. Decorative box that may contain x-rated Fortune Cookies, Massage Cream,Candy Cuffs, CD's, Chocolates, Candies, Stimulating Books, Edible Undies, Fun Games, Love Testers and much more. Call us to customize the contents of a box for your special valentine. Why not add fresh roses and a Happy Valentine's Day balloon!. Spend a romantic evening together sharing some wine or champagne, cheese, crackers, luscious truffles and chocolate hearts. Top it all off lighting the candle, opening the massage oil and relax!!! Finally, gourmet snacks that make Valentine snacking an art. We dare you to resist. Contains Goelitz Valentine deluxe mix, cinnamon hearts, chocolate hearts, cookies, assorted hand dipped chocolates, freshly roasted nuts, conversation hearts, and chocolate wrapped lips. Larger towers always available. A great office gift! Tempt your sweetheart with one dozen individually wrapped jumbo homemade chocolate chip cookies-on-a-stick. Delicately nestled with Valentine wrap and bow. Simply Delicious! ½ dozen long stem roses in a box with a box of hand dipped chocolates. Very Classy! 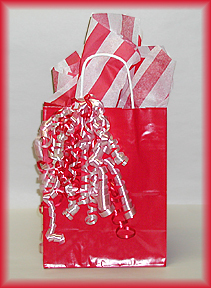 This Valentine gift bag contains lots of sweet treats  chocolate hearts, cookies, candy, nuts and so much more! Assorted Valentine candies with mini Valentines Balloon. Inexpensive but cute!